In a small town in northern Japan lives Katsu (Koji Yakusho), a 60 year-old lumberjack. He’s still grieving for his wife, who died two years earlier. He’s fighting with his son, who seems to spend all day sitting on the couch watching television. When a film crew arrives from Tokyo to shoot a zombie movie, Katsu gets unwillingly dragged in to help them source locations. Then he meets the film’s withdrawn and bullied director Koichi (Shun Oguri) and the most unexpected friendship develops between them. I went into The Woodsman and the Rain completely cold, having never heard of it or knowing anything about its plot, characters or even genre. Perhaps this is part of what made the film such an absolute delight. 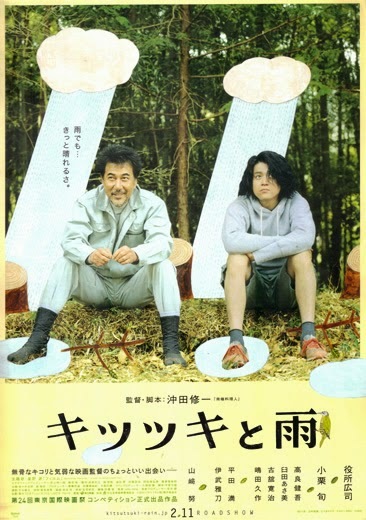 This 2011 Japanese comedy-drama is simply wonderful. It has a relaxed pace, appealing characters, great actors and an enormous amount of understated depth and soul. It’s Japanese to the core, not just from its story but from the way it’s shot – full of static and medium long shots and deliberately long takes. I haven’t seen anything else by its director, Shuichi Okita, but based on this I want to track his other films down. Koji Yakusho (13 Assassins, The Eel) plays Katsu with a world-weary heaviness and a naivety of heart. At the film’s beginning his life is clearly at a dead end: his wife is dead, he doesn’t understand his son, he’s been diagnosed with high blood sugar and can’t even enjoy sweet treats or desserts any more. When he’s first roped in to drive around Koichi and his production manager, Katsu is irritated. It takes much the film’s first act for him to lower his defences and embrace the odd situation within which he’s been thrown. Once he commits to helping the film it’s a joy to watch: whether it’s his gut-bustingly funny turn at acting (they persuade him to play a zombie when an actor fails to turn up), or his impulsive decision to persuade his fellow townsfolk to join the film as extras. Katsu’s narrative arc is The Woodsman and the Rain in a nutshell: a grieving widow rediscovers the joy of living. That the catalyst for this is a zombie movie can not be coincidental. Shun Oguri is similarly entertaining as Koichi, a clearly talented writer who’s an absolute disaster as a director: he’s under-confident, awkward, and constantly apologetic. At one point he tries to flee the town on a train, only to have his production manager track him down and physically beat him into submission. His developing friendship with Katsu is odd, but also believable: he comes to rely on Katsu’s pragmatic problem-solving on the set, and Katsu seems to appreciate his talents and wants to help him assert himself. It’s nice that the film doesn’t include some over-the-top transformation in Koichi. The film ends with his almost as uncertain as he was at the beginning; maybe a little more assertive, but more importantly much happier. I really enjoyed this film: beautiful pacing, great performances, a gentle and funny script. What more could you want? This review was original published at The Angriest on 2 October 2014.